WHY GO: Lexington MA is the best place in the USA to learn about the origins of our country and to celebrate Patriot’s Day. So, tell the truth: if you’re not from The State of Massachusetts, did you even know about Patriot’s Day before the movie about the Boston Marathon bombing came out? You’re not alone. Patriot’s Day, a State holiday that falls on the Monday closest to April 19th, commemorates the first armed rebellion in what became America’s War of Independence, which began in this small MA town 16 miles from Boston. STOP: Minuteman National Historical Park Visitor’s Center, Lincoln. 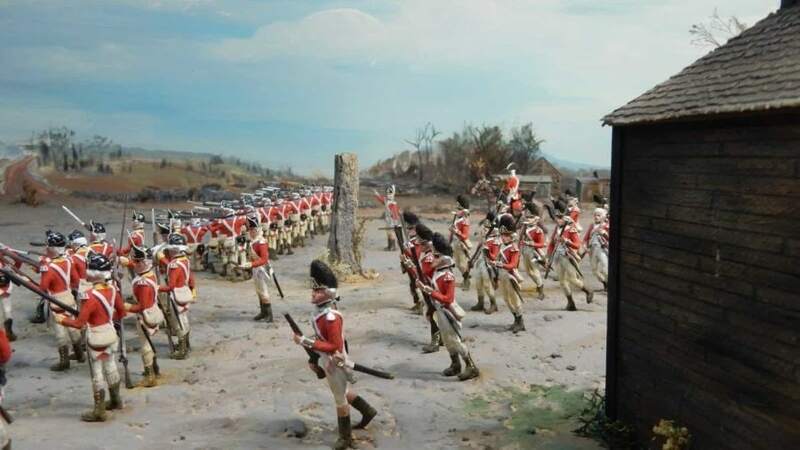 Located between Concord and Lexington, the Minuteman NHP Visitor’s Center interprets the opening battle of the American Revolution on the 5 ½ mile Battle Road which encompasses 11 historic “witness” buildings, informational signage, and pull-outs for parking off busy Route 2A. The Visitor Center offers exhibits, theater, orientation and ranger programs, and should be for stop # 1 for anyone interested in the timeline of events on the first day of the Revolutionary War. Open daily April 1 – Oct 31st 9-5, free. The Colonists were proudly English during the French and Indian War when British Redcoats and well-armed Colonial militias fought side by side. But the war drained England’s treasury, and in 1763, the government began to tax the colonies for the first time. The colonists groused about these long-distance tariffs. To enforce them, England sent troops into Boston in 1768. The “Boston Massacre” of 1770 got Colonial blood boiling. On December 16, 1773, the Sons of Liberty, in protest of Taxation without Representation, dumped $1.7 million (in today’s dollars) worth of tea into Boston Harbor. In response, in 1774, the British Parliament passed the Intolerable Acts, effectively closing Boston Harbor and prohibiting assembly in Meeting Houses. Colonial Official, General Thomas Gage sent for 3,000 British soldiers to enforce these new policies, so, American resisters moved to Concord, 18 miles away, forming a provisional government boosted by a large stockpile of arms. It was this stockpile that the English were after when they made their way to Boston’s outlying towns. On April 18th, Paul Revere and 40 other “Riders” warned locals at the Hancock-Clarke House of a British march, 700- 800 strong, first to Lexington and on to Concord. A “training band” of 77 men, under the command of Captain John Parker, mustered on the Lexington Green and waited (then grew tired in the wee hours, and retired to Buckman Tavern (see below). At around 5am, British finally arrived, and locals on the green, armed with muskets as a show of force, were ordered to lay down their weapons. Someone – it is still not clear whom and on which side – fired a shot, and both side panicked. Some militiamen ran, but some fired back. At the end, 8 colonists were dead and one Redcoat was wounded. Two of the most photographed structures in Lexington are on the Green: the Minute Man Statue and the Revolutionary War Monument, built in 1799. Seven of the 8 militiamen who perished that April morning are buried beneath this granite obelisk, claimed to be the oldest war memorial in the USA. Visitors Center open daily April-Nov. 9-5, Dec-March 10-4, free. Free tours of the Green on weekends in April and May, and daily from Memorial Day through October. TOUR: Buckman Tavern. Even before you enter the rooms of the old tavern, one artifact left from April 19, 1775 should command your attention. The original drum played by William Diamond to muster the town militia to the Lexington Green is very much intact, exhibited in a glass case among other remnants from that morning. After Paul Revere’s midnight warning, the Redcoats hadn’t appeared, so after a few hours, the band of militiamen dispersed. The “drumbeat to arms,” called all within earshot back to formation on the Common around 5am. In 1775, there were two licensed taverns in Lexington, which were generally patronized by men. But this one, owned by John and Ruth Buckman, had a gentler side, with an elegant tea and hot chocolate parlor for women. In the years leading up to the Revolutionary War, men gathered in the Tap Room to discuss business and politics. But women, too, were involved in “The Cause,” and showed their patriotism by shunning imported goods, growing their own tea, and holding a screw-England “Spin-In” on the Green. (On August 1769, 45 women took their spinning wheels to the Town Common and turned out homespun flax cloth). Looking outside, it’s remarkable to think that our country’s War of Independence began right here, though there is one physical proof of that fact – a bullet hole in the front door made by a British musket ball during the Battle. Audio-self-guided tours, $10pp. Open April-Oct. 9:30-4. TOUR: Hancock-Clarke House and Parsonage. This was the first house at which Paul Revere and William Dawes stopped to warn Samuel Adams and John Hancock, who were guests of Reverend Jonas Clarke, that “the regulars are out.” The British forces had begun their march from Boston to Concord. Built in 1737 for Reverend John Hancock, grandfather of the signer of the Declaration of Independence, the parsonage belonged to Clarke (who moved in 1755 after J. Hancock’s death), and his family during the Battle. A tour begins with a terrific recently made 15-minute video that explains the timeline of that day, and tells the story of the buildup to the Battle on April 19th. Adams and Hancock were staying here when Revere and Dawes arrived in town at midnight, and were able to flee before “the regulars” could capture them. The Green Room upstairs, where Adams and Hancock stayed before escaping, looks as it did that night, complete with a table where the two would have been discussing evacuation plans. Imagine the chaos of the night when the Riders got there. A letter from Reverend Clarke’s daughter describes the battle scene out of her window. In the aftermath, she, along with other townspeople, walked to the Green to help the wounded and bury the dead. Open April-Oct 10-4, $10. TOUR: Liberty Ride Trolley Tour. This 90-minute tour, running along the Battle Road Scenic Byway from Lexington to Concord, is narrated by guides in Colonial garb who recount the events of the morning on April 19, 1775. Runs April and May weekends only, daily Memorial Day to Last Sunday in October, $28 adults, $12 kids. VISIT: Munroe Tavern. A mile outside of town, this is where the British took refuge after retreating from North Bridge in Concord. In 1789, George Washington had a meal here. Check website for dates open and entry fees. VISIT: Scottish Rite Masonic Museum and Library. This unique, ok, quirky, museum tells the story of Freemasonry throughout American History. Open Wed-Fri. 10-4, free. SHOP: The Crafty Yankee. All kinds of Yankee made ceramics, woodwork, jewelry, glass, clothing and more. A fun shop to browse. EAT: Artistry on the Green at Inn at Hasting Park. Artistry is on the plate as well, in this fine, American cuisine restaurant. Starting with an “amuse bouche” that could double as a piece of pop art, order Mushroom Risotto ($32), Cauliflower Steak ($24), Clam Chowder, Roasted Broccoli Salad ($14) and other tweaked New England fare. You will be duly impressed. EAT: Locals also love Love @ First Bite for excellent Thai food in an adorable space (lunch specials at $12 are a bargain), Mario’s Italian Restaurant for casual but down-home good Italian, and Lexx for eclectic fare. ICE CREAM: Abbott’s Frozen Custard. If you question the existence of a decent chocolate mint frozen custard, be prepared to gain a few pounds putting that doubt to the test. Abbott’s makes the best version of that flavor I’ve ever mmm’d. Period. STAY: Inn At Hastings Park. A Relais & Chateaux Inn, IAHP is Lexington’s only luxury hotel and a Maven Favorite. You can read a full overview of it HERE.